Are you one that loses keys often? My daughter is habitually losing things. From the remote control to her keys, we always consider it a fun scavenger hunt when it comes time to search for something she has lost because you never know what we will find. As fun as a scavenger hunt can be, it really gets frustrating at times and mundane. Well no more will we have to worry about that thanks to Click ‘n Dig! This convenient and high quality gadget will beep the right device every time. 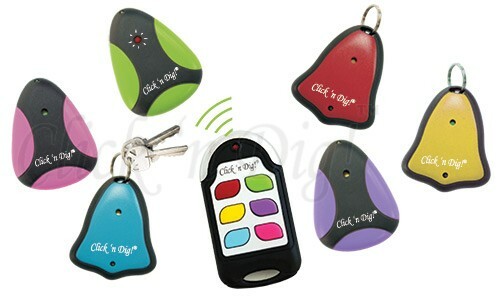 Simply press and hold the color-coded button on the radio transmitter to find an item up to 60 feet away. The transmitter’s radio frequency penetrates through walls, cushions, and more, so the receivers will beep and flash whether they are in another room or lost deep under the couch. 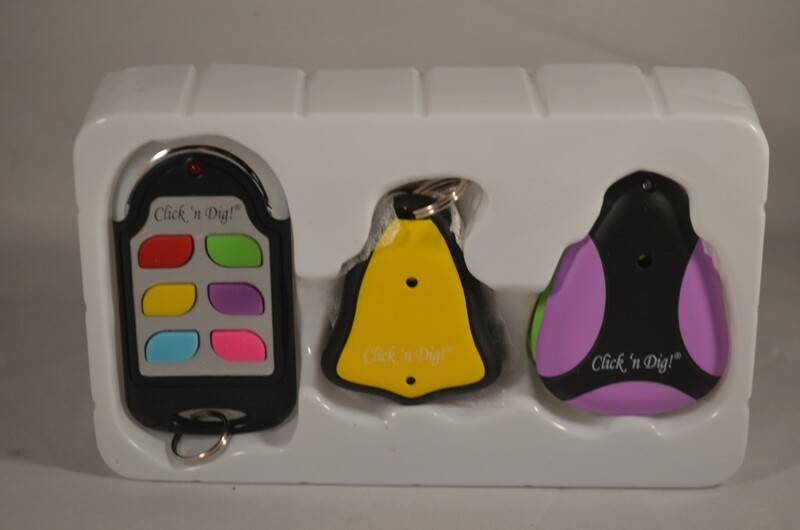 Now you never have to worry about losing your keys, wallet, remote controls, or cell phone again! This package includes: 1 transmitter, 3 key ring receivers, 3 thin receivers, 3 key ring attachments, double-sided adhesive tape, extra batteries. Add Click ‘n Dig! to your holiday wish list this Christmas. For the person in your life or yourself, who tends to lose or misplace things, your worries are over thanks to Click ‘n Dig! 1 winner will receive a Click ‘n Dig! 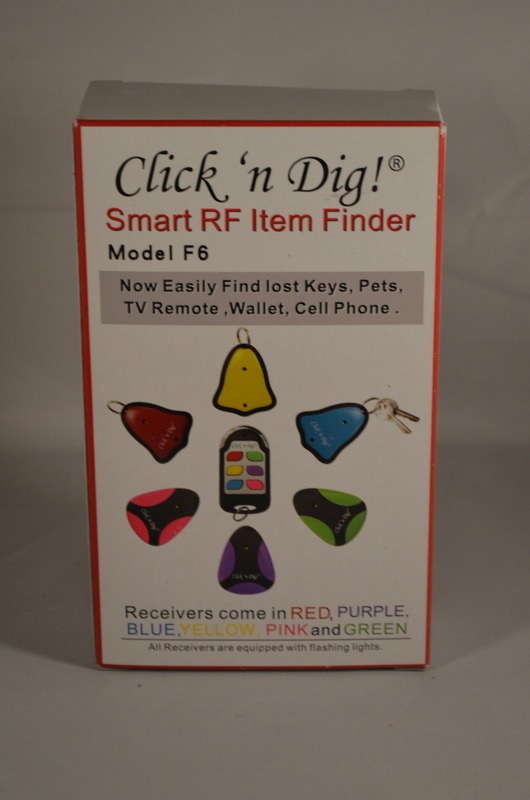 Smart RF Item Finder Set (pictured above) ($50 Value)! The giveaway ends on 11/20/14. I always lose the channel switcher,my keys,and the most lost item,my favorite hair brush,I lay it down and forget where I put it,It’s frustrating!! My drivers license, old baby pacifiers, car keys and a pocket book!! we just lost the remote two days ago in our bed and still havent found it, crazy, i have lost a tablet and found it under thecouch,that was probaly the kids,lol. Keys are probably the most often lost and then found. I lost my wallet last winter and found it in the Spring when the snow melted off our front lawn. I have lost my pill holder, glasses, keys, purse, cig holder, just about anything. This would be so needed when I am running late & can’t find, say my keys. It would cut the stress level down to nothing, in such a case. My badge gets lost frequently, this would be very helpful! You name it I’ve probably lost it. Keys once I dropped them in dumpster. Keys, Pens, credit card, remotes, and licence. Your comment reminded me of when my fairly new – $250 camera went missing a few years back. I couldn’t find it anywhere and I was some fit to be tied. I asked my other half to please get the trash bag he put outside so that I could go through it – thinking it fell off my desk into the basket. He was pissy over digging through the bags to get that one I wanted – but ya know what? That’s right where the camera was. OH my goodness…Where should I start…my keys, my purse, my wallet, my ID, my debit card, money, my book, my phone….I’ll stop here but the list can go on and on. I lose everything! You name it-I’ve lost it! Weirdest was when I found my purse in the freezer! I have lost prescription sunglasses and later found them in a pocket in my purse. My giant key ring was found in the diaper pail where the toddler threw them in an effort to help clean. I’ve lost everything I own at least once from my keys to my socks. I lost my keys looked for them for days dumped purse out not in there. Three days later DH went to get me my purse picked it up by the bottom of the purse and felt something . Some how the keys had went in the lining of the purse to this day don’t know how had to cut the lining to get them out.